Preheat the oven to 450 degrees Fahrenheit and line a baking sheet with parchment paper. In a large bowl (big enough to add the chicken wings in the next step), combine the gochujang, crushed red pepper, garlic, ginger, honey, rice vinegar, soy sauce, sesame oil, salt, and black pepper. Stir well. Add the chicken wings and stir to coat the wings thoroughly. Transfer the chicken wings to the parchment-lined baking sheet and place the bowl with any excess gochujang sauce to the side. 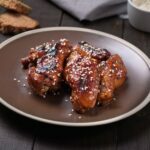 Place the baking sheet in the oven and bake the wings for 20 minutes, flipping the wings once at the 10-minute mark and brushing with more gochujang sauce (if preferred). Remove from the oven and sprinkle with sesame seeds. Serve immediately. For a crispier wing, in the last 5 minutes switch from bake to broil on the oven. Watch the wings carefully until you hit your preferred level of crispiness.